As a matter of fact, there is a systemic discord between the appraisal of Say’s economics put forward in this book and the appraisals to be found in most of the relevant literature…. In consequence, it is only to be expected that the publication of Jean-Baptiste Say… will give rise to a debate on Hollander’s canonical interpretation of Say that is as lively as the one that followed the presentation of the canonical interpretation of Ricardo in The Economics of David Ricardo. 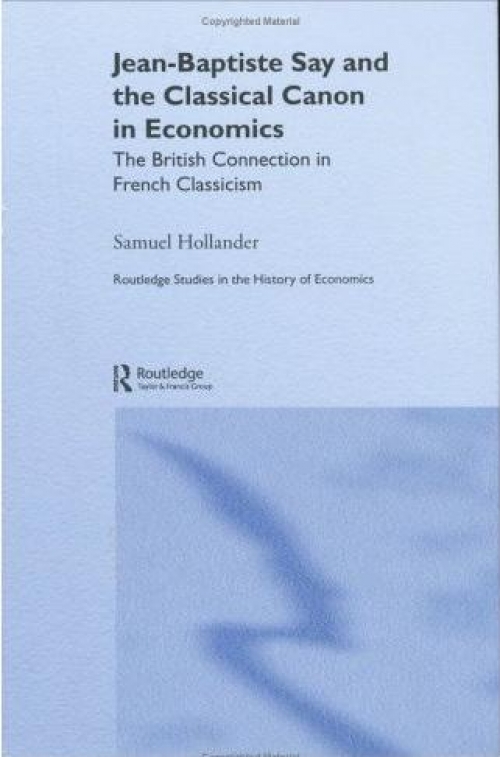 As we would expect, Hollander’s study is founded upon a profound knowledge of the writings of Say, as well as his exceptional knowledge of classical political economy. The book also benefits from his knowledge of the French language…. There is of course a price to be paid by the reader in the form of numerous and lengthy quotations in French. But this is a price worth paying if one is to fully appreciate this new study from an outstanding historian of economic thought.